Copyright : This item is reproduced courtesy of Australian Labor Party, South Australian Branch. It may be printed or saved for personal research or study. Use for any other purpose requires written permission from Australian Labor Party, South Australian Branch and the State Library of South Australia. To request approval, complete the Permission to publish form. There was intense debate in Australia over conscription during the First World War. Twice Prime Minister Billy Hughes attempted to force the issue to be passed, but both times referendums on the issue failed. 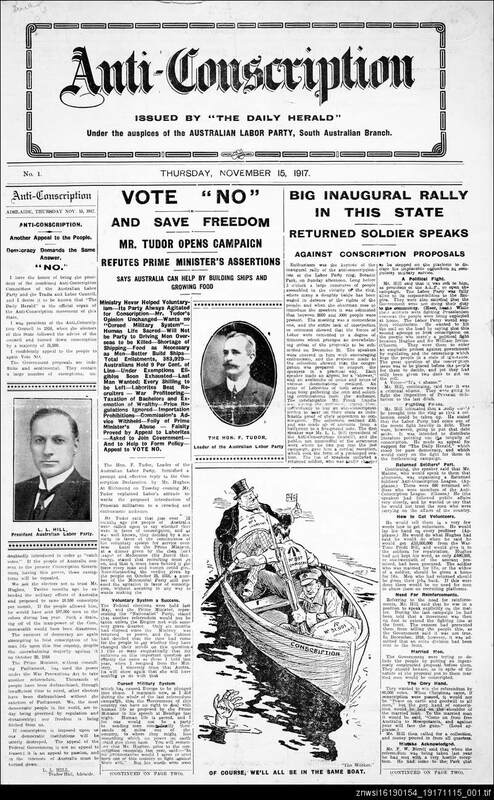 In 1917, prior to the second referendum, the local branch of the Australian Labor Party printed this newspaper.